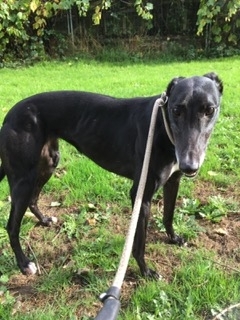 A beautiful 4 year old black female greyhound. She is a very calm gentle girl and quite a lady! She is really sweet and a real love to be around. 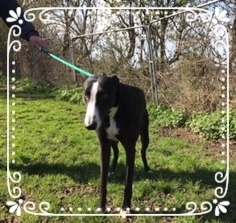 She has been reserved as fast as she came in as Bobby saw her picture and fell in love (that’s Bobby the brindle that was re-home from here a while ago)! Hopefully she will find him as attractive when they meet! At 2 years Feather can be a little shy! She is an absolutely beautiful girl who wasn’t interested in racing she much prefered an early retirement (before she started)! My type of girl! She is a little darling. 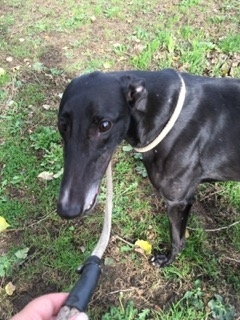 Olga is a 4 & half year old black female greyhound who have a fabulous personality. She is gentle and sweet but also playful and very loving. Olga loves to have a really gentle jump up for a fuss and takes her love with such joy! She is such a lovely girl and so much joy to be around. Olga would suit a family who could give her a lot of love and attention and go on nice walks on the lead and just be with her. She loves to be with people and she has so much to offer. She will make someone's life a much happier place with her in it. 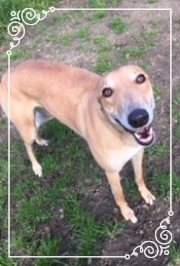 If you think you can make Olga's dreams come true then please contact 07811 296029 or email dawn@greyhoundrescue.org.uk leaving your name, address and some information about your circumstances (working pattern etc and any other animals). Please note that we do not re-home with cats. Meet Linda - Yes our little Linda! 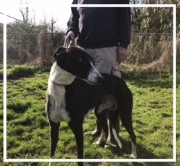 Linda is a 3 year old small but full of fun black female ex racing greyhound! This little lady appears shy on first meeting people but once she knows you, she is adorable and loves to play and is full of fun. She loves attention and although she has previously when in racing been kenneled with males, she can be quite bossy with then and so is better off on her own as she does seem to like all the attention to herself. That said she is not in any way funny with other dogs, but is a 'foody', loves her treats too and would never like to share!! She does think she is a puppy when she plays and loves to cuddle. She is also extremely 'quick of the mark'! She can also be very calm and sleepy like most greyhounds! Linda has in her racing career had an injury in her front leg and had pins in it whilst she was in racing. This was operated on some time ago and she is fully recovered. This does not bother her in any way from what we have seen of her but does make her extra special to us for being lucky enough to have survived a track injury such as this and making it to rescue! 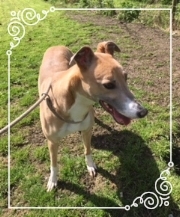 If anyone is interested in adopting Linda - then of course get in touch on 07811 296029 or email dawn@greyhoundrescue.org.uk and I will of course ask Linda if she thinks you are good enough for her (ahaha), please if you email, give details of your address and phone number etc. Are you 'Looking For Linda'? (It;s a song)! Linda is a real sweetheart! Meet Little Miss Treacle! -Has been rehomed! Here we have a very beautiful young saluki cross greyhound who we need to rehome urgently as she is really only a pup! She should really be in kennels at her age! She was brought in to us starved and quite timid although she really is not a timid girl once she trusts you!! She loves to play, really loves any food....adores people, children and bounces as soon as she sees you. She is totally adorable and a gorgeous colour too. She does however need some training - house training will be required and so we do require either an older couple or a family where one person in home in the daytime? She would suit an only pet household as even though she does like other dogs, she does get protective over food. Not with humans, just with other dogs! That is mainly to do with her being starved and may come right once she feels secure. We want to hear from people who understand the breed and know they cannot be let off the lead unless in a secure high fenced area and you need a secure back garden with no other pets (NO CATS). She is simply adorable and you will fall in love with her. She is a very loving little girl and very clean in her kennel. Mary like to play, she love people and other dogs. She is affectionate and very cute! And, boy! Does she know it! She enjoys her food though is not a greedy dog - loves her teddy and toys. Great on the lead. 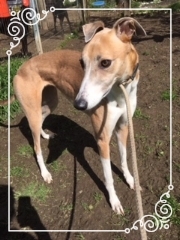 Mary is looking for her forever home now she has retired from racing and would really like to relax into a family as soon as possible because she says she has such a lot of love to give it is wasted here in the kennels. She wants to spend her days making her forever family happy (she did say no offence to us) but she would really like a house with a sofa and TV because she is getting bored already with Magic FM and since LOBO is in control of the radio she gets no choice in that right now! But she has heard that the TV is much more fun! Plus, she would like to go for walks with her new family and rides out to different places maybe? 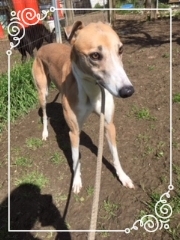 So, if you think you could make Marys' dreams of the perfect life come true.... please email dawn@greyhoundrescue.org.uk or call 07811 296029 - you will not be disappointed - although we will as we will miss her! He is good on lead, although he is a big lad! He loves his food, he adores people. He has not been kennelled with other dogs but has been walked with them. Spud is a very friendly boy but we are wanting to re-home him with a couple or family with older children, simply due to his size! If you think you can give gorgeous lad a home, then please get in touch! 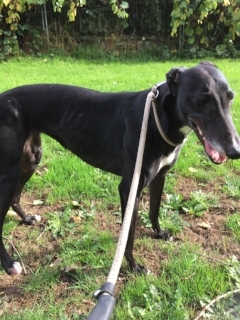 Deacon is a gorgeous black greyhound with so much love to give and full of fun. He is 5 years old, very good on lead, loves his food, loves to play. He is very good with other dogs and likes his girls! This boy is a sweetheart and we were going to use him for fundraising but after 'Gem lot her kennel mate Teddy' we decided to put Deacon in with her to cheer her up as she has become depressed. He certainly did this for her and got her back to the happy confident Gem we know! 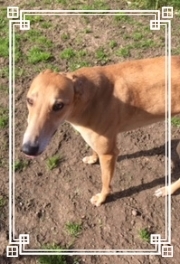 He also did the same for Bonnie (who lost he kennel mate 'Harry') so Deacon we feel has done his bit to deserve a home, especially after he has also been a racer so we thought long and hard about it and we cannot be selfish and keep him kennelled - he needs the one to one love he deserves. Jess is a 4 year old female greyhound who loves to play and of course sleep....well, she is a greyhound! Jess is a quiet girl, though whilst saying this she is in no way a timid dog! She very much enjoys her food, loves attention and is a very easy dog to handle. Jess will make the ideal companion and will look fantastic on any sofa! If you think you have the looks and and style to make this girls dreams of a forever home come true, then please call Karen or Dawn on 07811 296029 or email. Barney is a 6 year old male greyhound who loves everyone and everything! He is very good on the lead and has been handled by children. He is a very friendly boy and will make a fantastic family pet. If you think you have what it takes to make the rest of Barneys life complete, then please contact Karen or Dawn on 07811 296029 or email. 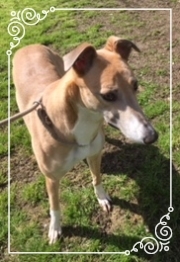 Frosty is a 4 yrs old very, very loving greyhound who will make a wonderful companion. He loves attention any food and going for walks. 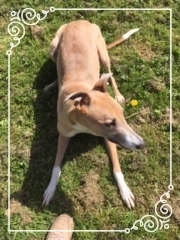 He is due in soon to greyhound rescue and we are looking to get him re-home as soon as possible. He will be an excellent sofa buddy for you, so if you are thinking about a greyhound then stop thinking and just go for it! They are just adorable! If you think you can make Frostys' dreams of a new life come true then please contact Karen or Dawn on 07811 296029 or email.